Stock car racing today has its own problems and a lot of the young people involved in it haven’t the slightest idea of what racing was like in its infancy. Today, the sport has difficulties centering around so many rules to keep everything in perfect parity and to try to keep skyrocketing costs down. The sport is now cut – out vinyl, crate engines, safety equipment up the yingus, and transponders. Many, many teams cannot carry on without enclosed trailers and more than one car. Costs had soared and purses have fallen to the absolute ridiculous. 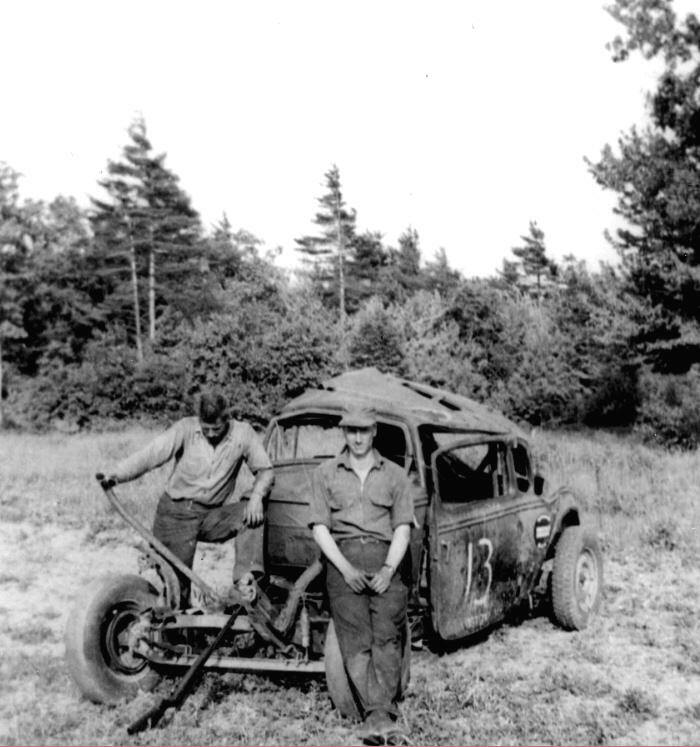 Armand Sirois, at Maine’s Norridgewock track, in the early days. Seeing a woman in the pits is unusual in that era. When the sport started, in the very late ‘40’s, it was a wide open affair. True, someone could get really hurt, back in those days, but few went fast enough to do so. Stories from the early era are peppered with anecdotes that made it a most human and accessible sport of the masses. The Deep South, with its moonshine runners, had gotten a strong head start on the rest of the country which took decades to erase; but each portion of the United States has its rich lore from early racing days. Up North, many tracks were simply ovals scratched out in an empty field – with no fencing, no real stands, and few outbuildings. One such place was the Concord, Vermont race track, [the first track in Vermont to choose the name “Devils’ Bowl”] which was about one mile from Northeastern Speedway. Located on the property of Ed Marko, people would sit in grassy banks just off from the racing surface and listen to Ed’s brother, Bob, on a portable sound system. Dave Morse, the venerable reporter from Caledonia County and a close friend of Ken Squier, the great [and scary] Ronnie Marvin racing there. He says the massive Marvin would enter and leave the little white #13 coupe through the roof. 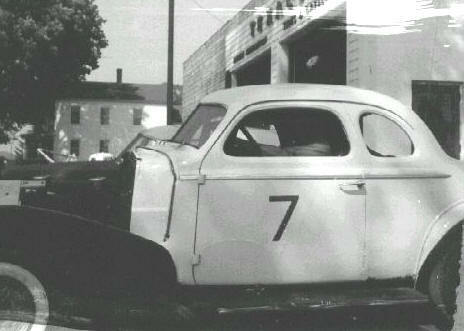 Harold Hanaford with the car he towed, from track to track, in the early fifties. Lancaster, New Hampshire had a track called Log Cabin Speedway, named after a business nearby. The track also had a restaurant located in front of it called The Potato Shed. Doubtless, the Plymouth, NH driver Harold Hanaford ran that track, the Concord track, and every other little hole in the whole in the area. Hanaford may have been the most traveled driver of the early era. The George Barber Bradford Auto Supply team, one of the first professional – acting groups, also would have run at the two tracks when not venturing to bigger tracks to the south. Many of the oldest drivers, like Jackie Peterson, refer to a track in Sheldon, Vermont. One of three tracks using the moniker of Green Mountain Raceway, it was located on what today is the Rowell corporate farm on the Morey Road. Guys like Peterson, Ed Charbonneau, and others of that era who have supplied me with information, all have alluded to Sheldon. The track was then at Don Moore’s farm, and they would run anything from sprint cars to family cars there. Jackie Peterson takes his sprint car around the Sheldon track, around 1950. Supposedly, the Green Mountain [or Green Mountain Farm] Raceway was not the only [or even the first] track in Sheldon. The track on the old fair property was operated by partners Wes Menard and Bob MacKenzie in 1949. According to Menard, he drove a lot and Bob did most of the work. Menard, whom Jackie Peterson still recalls as “Wild Wes” Menard, would drive his entry from his home in Swanton, right up Route 105, to the Sheldon track. Menard said his track – running days were cut short by military service; Peterson claims it was a big wreck when Wild Wes tried to crash into him at Sheldon. wives pose somewhere in the early 1950’s. At any rate, Jackie recalls running at Sheldon, following the well – known Bob Bushey [the Spud 19] around. The Spud 19, recently having been the Erwin Bettis #358 driven by Allen Maskell, sported at least three large, chrome passenger car bumpers –two being side nerf bars. Bushey slowed, Peterson struck his car in the rear, Bushey’s bumper broke off, one piece came through Peterson’s windshield, and JP was struck in the forehead by the debris. I doubt there was even much of an ambulance there. Bob Bushey [facing camera] and his amazing removable bumper. Carl Trayah’s car is in the background, at left. This is likely at Colchester – Bayview Speedway. Most of Jackie Peterson’s stories either begin or end with him either checking into a hospital or being released against some doctor’s advice. In just the few conversations I have had with the nearly 90 – year – old Peterson, I have already lost count of his hospital visits. It is a wonder Peterson can still get around, with all these old injuries, let alone ride a bike every day as he does. Guys from around the West Lebanon, NH area tells stories of the old stories of the old West Leb track located where, today, is the local landfill. The track was apparently owned by the Goodwin family, and one of the stars there was the son, Peanie Goodwin. The track owner, probably a man named Pop Goodwin, was a good driver in his own right. A couple of the better drivers there were Carroll Weeks, of Meriden, and Plymouth’s highly – traveled Harold Hanaford, known there as “Hot Rod” Hanaford. Hanaford won one of the West Leb races, besting the two Goodwins, along with everyone else, and the irritated track management refused to pay him the purse. Hanaford later returned and, again, defeated the family drivers. This time, the track management declared him illegal and – for the second time – Hanaford missed out on the massive $40 prize. Years later, Hanaford and his crew would face a similar situation; but – this time – the stakes were much higher. At that venue, his crew threatened to pull down grandstands with a wrecker before he was paid his winnings. Race cars line up near the pits at a very rustic track in West Lebanon, NH. The 12 is George Condon. That is Ray Sanborn in the last row. Some of the stories were not as amusing. 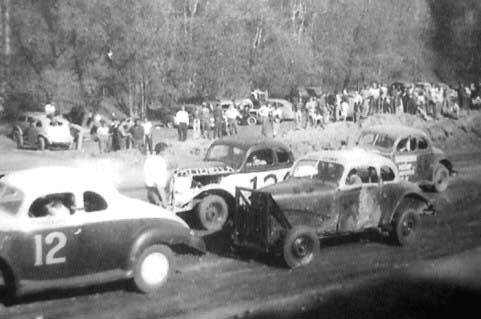 At the Plymouth Fairgrounds, one of New Hampshire’s earliest stock car tracks, Hanaford was racing against a lot of the Granite State regulars when he saw the red flag displayed and stopped. Local driver Langdon Ambrose did not see the flag, and – bearing down on the stopped Hanaford car – he tried to fit between Hanaford and the fence. He went through the fence and struck a horse display ring post. The post tore his arm off. Flagger Jimmy Mayhew tore off Ambrose’s shirt and held his hand in the cavity left by the arm until assistance could come. Ambrose was left to appearing at races and collecting charity from people there, for quite some time after. This car, shown at Franklin [NH] Motordrome typifies the cars of the day. Although, few had that professional lettering as this one did. Ed Charbonneau tells stories that illustrate how informal the sport was back in 1950 – at least in the North Country. He tells of Beansie Dumas, a man famous for having a big, yellow snack bus near Burlington, Vermont’s Battery Park for decades, having constructed a #99 stock car. The car was one of those with the roof removed and the roll cage on the outside of the car. Firstly, when the young man selected by Dumas to drive the car was declared too young to drive, Ed was drafted to drive. Charbonneau promptly rolled it, and that was enough for Beansie to want out. After watching her husband roll over in the 99, Ed’s wife bought it for him. Ed and his pals, the Trayahs, would drive that car and another just like at the several tracks in the northwestern part of Vermont for the next year or so. Norm Chaloux, who would be injured in that car at Northfield. The Trayahs were another story, altogether. Aptly named “The Fightin’ Trayah Brothers”, Carl and Herb fought at the drop of a hat – with anyone who got in their way and – when no one was available – with each other. Even their sister, Viola, would get into fights in the grandstands. Ed Charbonneau says her brothers had to think hard before getting into it with their sister. Herb was driving the car, one afternoon, at Sheldon, when another car took the door off. Herb continued on, arm hanging out, until a worried Ed called him in. After that, the car’s exoskeleton roll cage had more pipes on that side. All Herb had to hold him in was an old WWII ammo belt. and the 97 might be Leonard Barcomb. It took a lot to hurt the muscular Barre granite cutter. 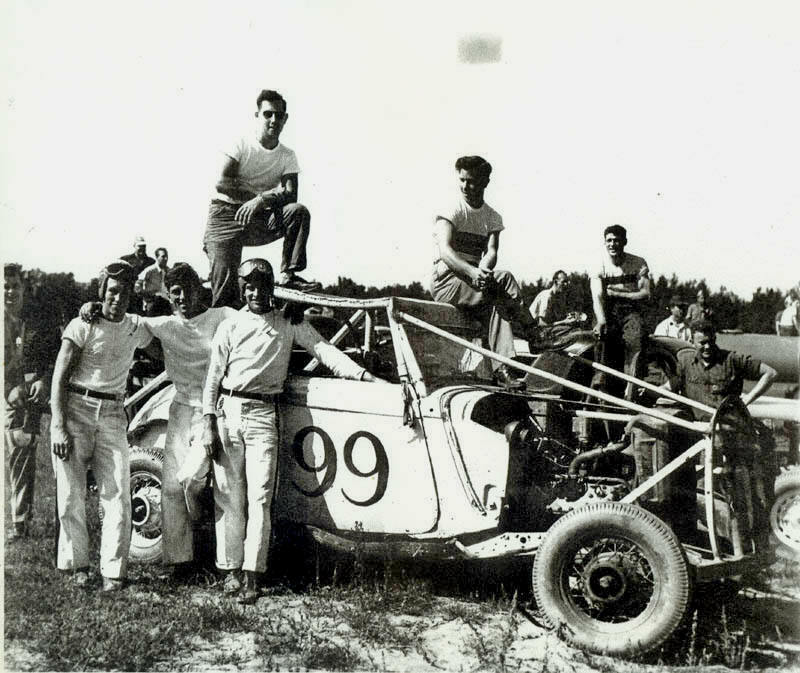 The boys decided to let Barre, Vermont’s prominent Flying Frenchman, Norman Chaloux drive the 99 at the old Dog River track in Northfield. Chaloux dug into a bump, the car partially accordioned, and Norm got a broken shoulder and collarbone. After that, Herb Trayah sold the car to someone in Middlesex, Vermont and the Trayahs built better cars, while Ed Charbonneau thought it time to get out while he was still in one piece. Tracks were sometimes as dangerous as the cars. Many of them were active or closed fairgrounds tracks whose surfaces and fencing were only adequate for horse racing. As one story goes, the Champlain Valley Exposition [the Essex Junction, VT fairgrounds] were hosting stock car races when one car went through the board fence. A board went into the car between the driver’s legs. It then conveniently lodged under the seat. Inches different would have meant another controversial tragedy to go along with the infamous Art Bessette death. The State Police did raid the race and throw out any car without installed brakes [and there were several]. Ah, the good ol’ days ! How could anyone cast safety aspersions on the finely – honed racing automobiles of the early 1950’s ? Preposterous ! Different drivers had varying ways to gain an advantage, something unheard of in this day and age. A teenaged Beaver Dragon started his career at Colchester – Bayview Speedway, in Malletts Bay. He won the first feature he was ever in, running a car burning gasoline laced with some liquid rock blasting ingredient. Dragon said they could not even turn the car off between races; it would just continue running unless someone stalled it out. He said he and the team were getting the hairy eyeball from a lot of the track veterans. One Malletts Bay regular probably did not dare give anyone else the hairy eyeball over suspect race fuels. Ronnie “Rollover “ Farnsworth, a man who would roll over his square – bodied Hudson for a ten dollar payment, had been gaining an advantage by running airplane fuel in it. Ed Charbonneau, one of Farnsworth’s buddies, says that worked out wonderfully until the airplane gas would inevitably burn the valves out of the engine. damage to one of Ronnie's #13 Hudsons. There was a race track of sorts in the Lamoille County [VT] town of Morrisville. This was one of several that popped up around 1950 or 1951 and which disappeared almost as quickly. An oval with few barriers or spectator amenities, onlookers and participants apparently mixed before, after, and even during race events. According to lore, a promoter from further north in the state, named Howard Conley, was operating the races. In job particular case, he became involved with a problem that would call him away from his other task of announcing the action. He is said to have handed the mike over to a teenaged boy who had been hanging close by. That boy, named Ken Squier, proceeded to do such a fine job, the promoter never wanted the mike back again. Squier likes to relate the story of a harrowing experience he had at Morrisville. Having become the regular announcer at the track, Ken would ride his bike over the back road from his hometown of Stowe to the track, which was on the way from Stowe to Morrisville. Apparently, word of the races in Morrisville had reached drivers and owners in Chittenden County perhaps because Chittenden, Orleans, and Lamoille County drivers all drove at the Green Mountain track in Sheldon. Soon, some of the interlopers from the south were showing up in Morrisville. Ken Squier, still very young, works the microphone at another early track. As Squier explains it, the northern cars were much heavier than the Chittenden County cars [and somewhat cruder, as well]. Drivers like Ronnie “Rollover” Farnsworth, Gordy Owen, Rex Shattuck, and others began dusting off their more cumbersome local rivals, and the latter drivers did not like it. They decided to bring in someone to handle this situation. Down from the old Newport track came Albert “Killer” Kincaid and his big car that was simply called the “Lucky Old Son”. Kincaid was raising unparalleled chaos, shoving all the lightweight southern cars off the track. One particular Chittenden County driver was debutting a brand new car. When it suffered the same fate as the others, he became incensed, rushing over to the Kincaid car, proceeding to pound on the Killer while he still sat in the Lucky Old Son. he All hell broke loose, and a full – scale riot developed. Track officials, Squier, took refuge under the flat bed truck that acted as the announcer’s and judges’ stand. Someone thought quickly enough to realize that the National Guard was training very nearby. of those heavy northern stock cars. By the time the Guard was mustered to the scene, the vast majority of the assemblage was in full battle. One old bearded man, using crutches, would swing them at anyone who came near him. Needless to say, after the mess was quelled, there was no further racing at the site. Ironically, the site today is occupied by a Catholic elementary school. Squier used his experience to launch one of the most remarkable announcing careers in the history of sports, as well as ownership of race tracks in Vermont. 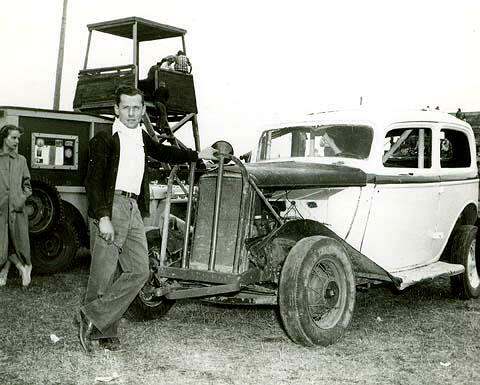 After viewing every sort of disorganized, crooked, and dangerous type of track operation, a young Ken was brought in on the progressive and efficient Northeastern Speedway group. He was so inspired, he started his own track which sadly and ironically put Northeastern out of business. Some of those lighter Chittenden County cars start at Colchester – Bayview Speedway, in Malletts Bay.